Everyone loves to talk about the weather, and this winter Mother Nature has served up a feast to chew on. Few parts of the US have been spared her wrath. Severe drought and abnormally warm conditions continue in the west, with the first-ever rain-free January in San Francisco; bitter cold hangs tough over the upper Midwest and Northeast; and New England is being buried by a seemingly endless string of snowy nor’easters. Yes, droughts, cold and snowstorms have happened before, but the persistence of this pattern over North America is starting to raise eyebrows. Is climate change at work here? One thing we do know is that the polar jet stream – a fast river of wind up where jets fly that circumnavigates the northern hemisphere – has been doing some odd things in recent years. 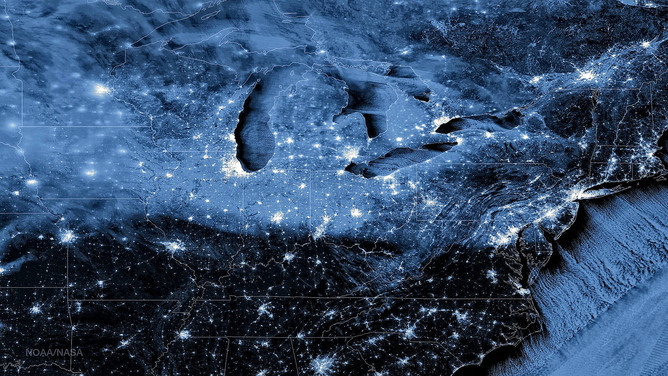 These long-lived shifts from the polar jet stream’s typical pattern have been responsible for some wicked weather this winter, with cold Arctic winds blasting everywhere from the Windy City to the Big Apple for weeks at a time. We know that climate change is increasing the odds of extreme weather such as heatwaves, droughts and unusually heavy precipitation events, but is it making these sticky jet-stream patterns more likely, too? Maybe. The jet stream is a dastardly complex creature, and figuring out what makes it tick has challenged atmospheric scientists since it was discovered about 75 years ago. Even more elusive is figuring out how climate change will affect it. Jet streams exist because of differences in air temperature. In the case of the polar jet stream, which is responsible for most of the weather we experience around the middle-latitudes of the northern hemisphere, it’s the cold Arctic butting against warmer areas to the south that drives it. (A more in-depth explanation can be found here.) Anything that affects that temperature difference will affect the jet stream. To study the effects of Arctic change on weather patterns, we have good measurements of atmospheric temperatures and winds going back to the late 1970s, when satellites started providing data, and pretty good measurements back to the late 1940s. My colleagues and I have been using this information to measure the waviness of the jet stream and whether it is behaving differently since the Arctic started its rapid warm-up about 20 years ago. Because the upper atmosphere is such a cacophony of swirling winds, however, measuring changes in the jet stream’s waviness is tricky, as it’s not a metric that scientists have traditionally used. Our challenge, then, is to find new methods to measure waviness and determine whether any changes we find are related to rapid Arctic warming, to some other change in the climate system, or to just random chance. While the story is still in early days, the plot is thickening. Several groups around the globe, including my colleagues and me, are trying to understand the linkages between rapid Arctic warming and changes in weather patterns. 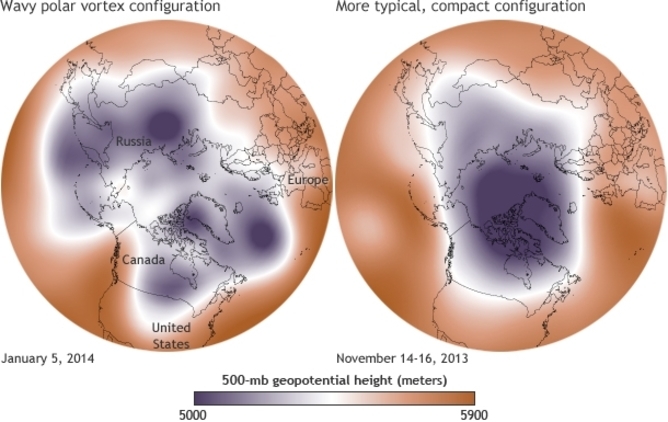 A number of recent studies have found what appears to be a solid connection between sea-ice loss in an area north of western Russia during the fall and a rash of abnormally cold winters in central Asia. The loss of sea ice favors a northward bulge in the jet stream, which strengthens surface high pressure to the east. That shift pumps cold Arctic air southward into central Asia. Other studies suggest that Arctic warming in summer leads to a split jet stream – or two separated rivers of wind – which tends to trap the waves. Those stationary waves cause weather conditions to remain “stuck” for long periods, increasing the likelihood of extreme heat waves, droughts and flooding events in Eurasia and North America. 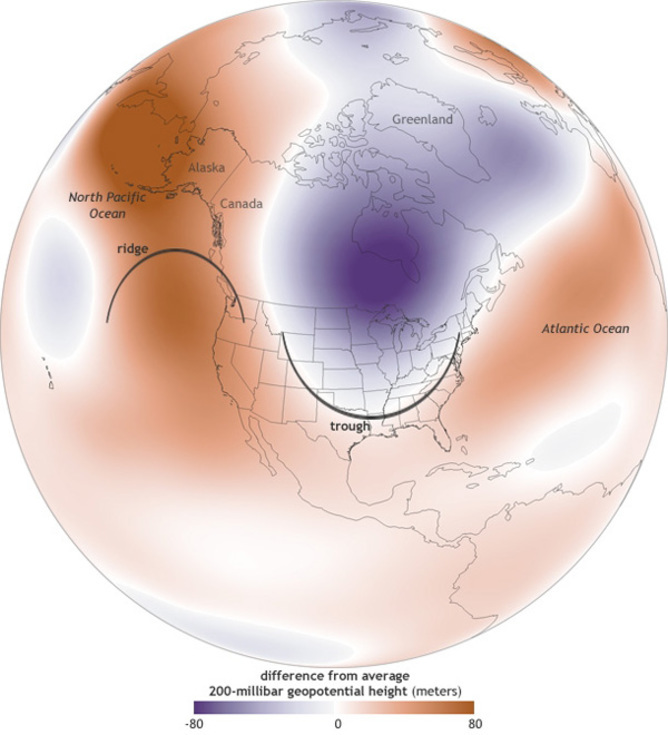 Our own new work, published last month in Environmental Research Letters, uses a variety of new metrics to show that the jet stream is becoming wavier and that rapid Arctic warming is playing a role. If these results are confirmed, then we’ll see our weather patterns become more persistent. In other words, Ridiculously Resilient Ridges and Terribly Tenacious Troughs may become the norm, along with the weather woes they cause.